How Come Cinnabon Doesn’t Cure Obesity? Scanning the latest hyperbolic headlines on obesity research, we’re left with just one question. Does Cinnabon have a cure for obesity? It’s really quite amazing. 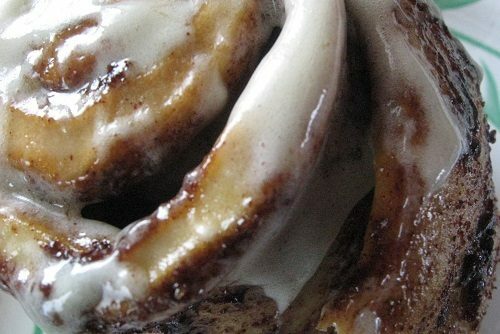 The Tech Times tells us “Cinnamon Could be the Secret Ingredient to Weight Loss.” USA Today says “Cinnamon May Help Attack Fat, Fight Obesity.” So maybe all that Cinnabon smell wafting through the airport could make us drop a few pounds, eh? Unfortunately, health reporters are fudging a bit. The amazing research they’re spinning is lab work. Researchers studied cells in a laboratory. No humans. Not even a mouse. No real cinnamon. Just fat cells from mice. and adipose stem cells from humans. They analyzed how a chemical from cinnamon – cinnamaldehyde – might affect signaling from those fat cells. The scientists found an impact on signals from those fat cells related to thermogenesis and metabolic responses. It’s perfectly valid basic research. But it tells us nothing about clinical outcomes. Cinnamon has been part of our diets for thousands of years, and people generally enjoy it. So if it can help protect against obesity, too, it may offer an approach to metabolic health that is easier for patients to adhere to. Are they lying? Or just having fun? It makes no difference. In the end, what they’re doing is trivializing obesity, its health impact, and obesity research. The real message is that this is a frivolous subject. And publications think their readers are dumb enough to go for this click bait. Shame on the University of Michigan for whipping up this froth. Click here for the study, here for the press release, and here for a sample of the nonsense. Science evolves by smashing pedestals, conjecture and refutation. Needless to say cinnamaldehyde and accelerating metabolism is merely conjecture. On the other hand, the Cinnabon is a delicious pastry evidenced by public consensus and sales….. When they get to the empirical testing of Cinnabon. I would like to volunteer.as a subject…. Well, they do indeed go for it, but it's not, imo, a matter of too few smarts. It's instead a matter of hope — as always, hope for a "magic bullet" that will make what is extremely difficult (permanently changing eating habits to reduce Calorie intake) an easy and simple thing. Or, far better, magically melting fat away without having to pay the terrible price (permanently changing eating habits to reduce Calorie intake). Hope springs eternal, and click-bait will spring eternal along with it.